The Rebel Sweetheart. : The Good, The Bad, and The Country. "There will always be bad people in the world..." so goes this quote that I stumbled upon on the internet. And yes, that is true. In any profession, there will always be bad people - politicians, lawyers, government employees, doctors, actors, and even cops. 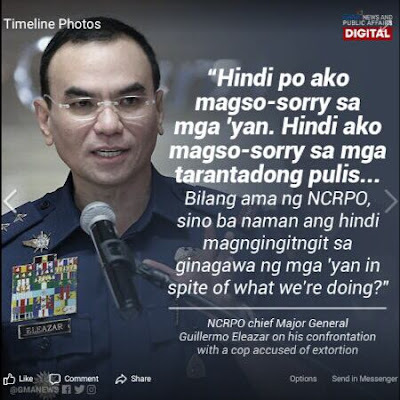 Here in the Philippines, we have had our fair share of 'bad cops' - those who are abusive of power, corrupted by money, and evade agency rules and culture just to satisfy their greed. A classic example is this 'kotong cop' who tried to extort money from the family of a drug suspect. 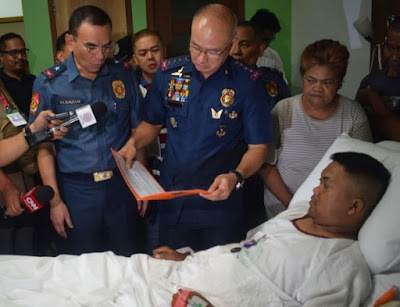 Police Corporal Marlo Quiebete for his actions. Police Corporal Marlo Quibete was about to get away with Php 20000 in cash, aside from the motorcycle owned by the family of the drug suspect, but was foiled in the entrapment operations of the Regional Special Operations Unit. 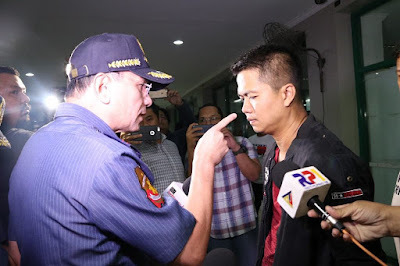 When NCRPO Chief Brigadier General Guillermo Eleazar came face to face with this 'rotten egg', he was not able to contain his anger and gave the latter a serious scolding, complete with finger-pointing and a barrage of expletives. I really can't blame the Chief, though. 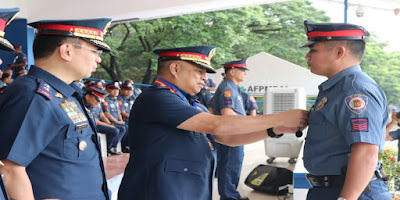 He has been working so hard to clean the ranks and rebuild the image of the Philippine National Police, only to be tarnished again and again by these scalawags. He's not sorry for what he did, and I totally understand that from a parent's perspective. I wouldn't tolerate my child's bad behavior, and if he needs to be punished, he will be. Busted - Police Officer 1 Ferdinand Rafael. 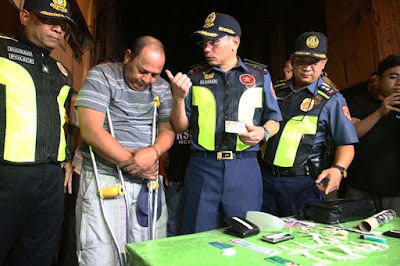 Another case of 'bad cop busted' is that of Police Officer 1 Ferdinand Rafael, who was nabbed for trafficking and use of prohibited drugs. He too, received a rebuke for his unlawful actions. Similarly, the two policemen were chastised for 'moonlighting' as escorts for a businessman in Pasay City. Busted for the unauthorized police escorting. These 'bad cops' that I have mentioned have been booked and charged, and are now detained. Serves them right for going down the wrong path and choosing money and power over ethics and morals. 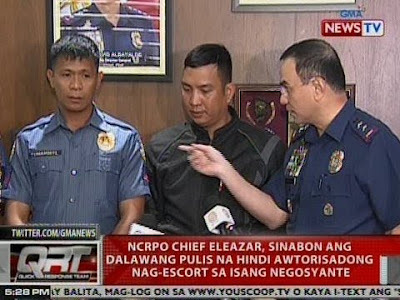 Time and again, General Eleazar has warned the police force not to partake in illegal activities, otherwise they will have to face the consequences. But like in dramas and movies, the good always outweighs the bad. There may be a few rotten apples in the barrel, but there are more good ones. 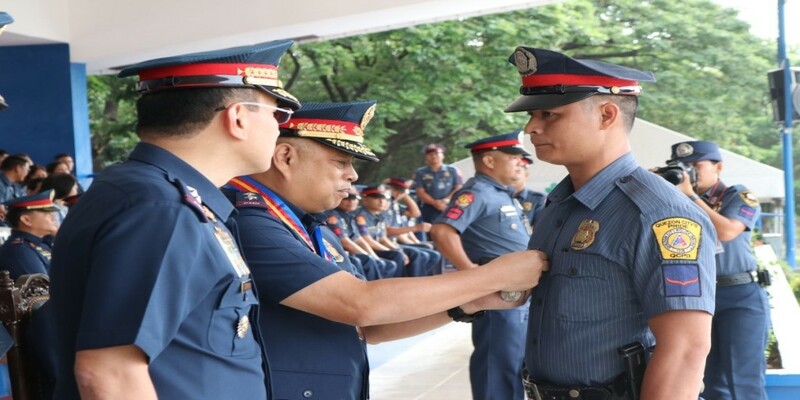 And in the PNP, the 'good cops' get rewarded for their passion to serve, bravery in the face of adversity, and dedication to their work and the country. Recipients of the Medalya ng Sugatang Magiting. 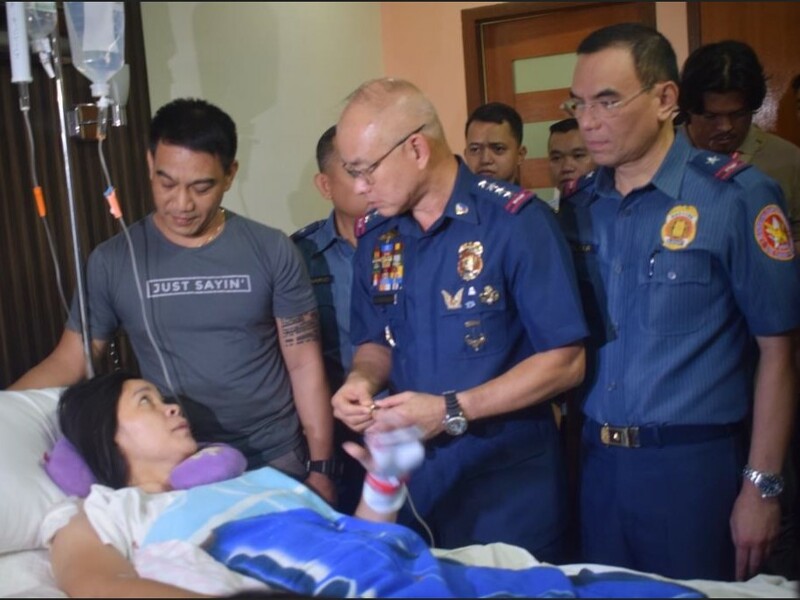 Among those who received the Medalya ng Sugatang Magiting (PNP Wounded Personnel Medal) are PO3 Christina Villanueva, PO1 Arman Cañezares, SPO1 Jerry Pascual, PO1 Jonathan Peralta, PO1 Marino Dulagan, and PO1 Leo Mar Orence. 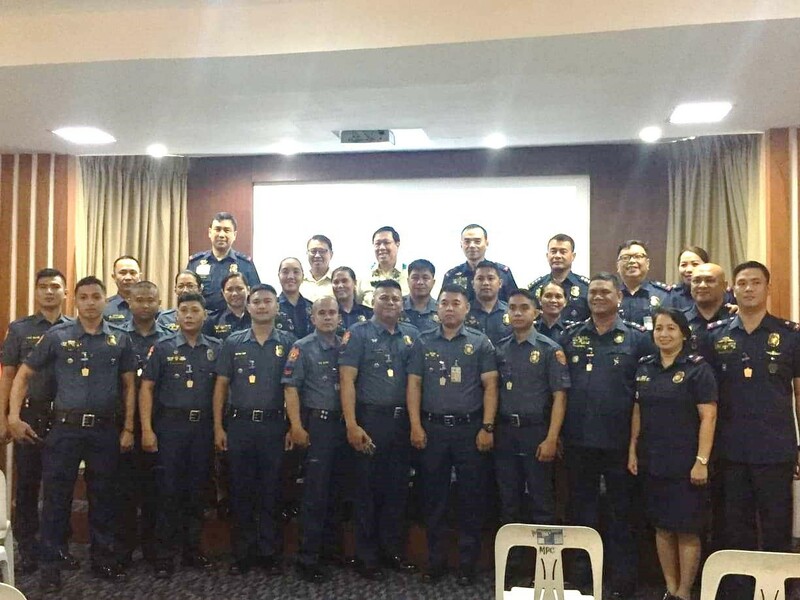 Recipients of the Medalya ng Kagalingan. Some policemen also received the Medalya ng Kagalingan (PNP Medal of Valor), the highest award of the Philippine National Police. 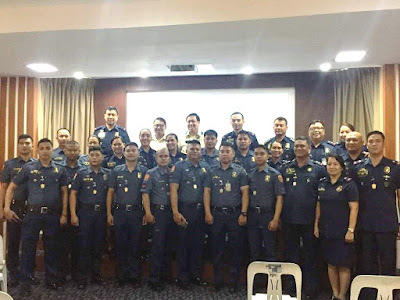 These policemen are: Police Chief Inspector Sandie Caparroso, Police Chief Inspector Alfonso Saligumba III, SPO2 Emilio ABoyolen, PO3 Mario Maramag, PO2 Marlon Ico, PO2 Raymund John Sansano, PO1 Eustaquio Nuarin II, PO1 Francis Miko Bose, PO1 Rodel Sibal, PO1 Marvin Fang-asan, PO1 Roy Uanan, and PO1 Eddie-son Galpao. Looks like we still have more good men (and women) in the police force, and I see a glimmer of hope in this picture. 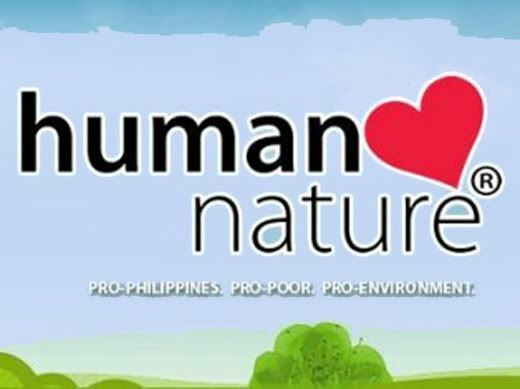 Famous philosopher Jean Jacques Rousseau believed that man is good by nature. I think so, too. oh wow this is so interesting to read about what everyone was honored. i so appreciate the police force in any country! God bless our country. I still believe we can be better in the near future. I am from India and the situation here is similar too. Corrupt police officers and so voilent sometimes. But yes, there are good guys too doing there job honestly and with love. That’s quite an interesting story! Really appreciate. Very interesting read, I had no idea this was a problem in the Philippines. I'm glad this story has a happy ending. There are people of all kinds. In a city in my country, they detained the police chief and part of his team for extorting and threatening most of the merchants. But as you say, there are always good people, like one of the policemen in my city who gave him a prize for saving a life. May mga mababait pa rin sa kapulisan! Saludo po kami sa inyo mga Sir!!! This is such an interesting story - and hard to judge because yes I have had my encounters with bad cops too. But there will always be people more than good, and the good ones are leaving traces. That is good that he's trying to rebuild the image of the police there. It's sad that there is so much corruption in this world. That is good that he's trying to rebuild the image of the police there. It is sad that so much corruption goes on in the world. This is so new to me. I did not know all of this stuff was happening but so happy to hear about the outcome. This is happening even in the other Countries. Glad that there were still good policeman like him. Hope he inspire our future cops. With power comes all kind of bad things which people get easily carried away with. I love reading stories like this! My uncle is a police man and it's nice to know there are people out there like this still! Thanks for sharing about these men in uniform. They are the guardians of our society and their actions should reflect that. I think the corruption problems you`re having in your country has to do with integrity.Goverment workers do not earn enough worldwide (to my knowledge) but it`s not everywhere you`ll find such corruption in police force. There will be a bad cop or good cop in every country not just in the Philippines. This is really interesting to read. It is tough when those who are supposed to be serving the people, end up committing crimes against the people. However, I am convinced there are more GOOD cops in the world than bad cops, but we tend to mostly hear about the few bad ones. There is always bad cops in any part of the world. You have to be careful. A very interesting story, I like to read this..
That's so true, there are good and bad people in police too but what it good that action was taken against them and the good cops were rewarded. That was great. There are still good people around us! Yes, there are still good cops in the ranks. 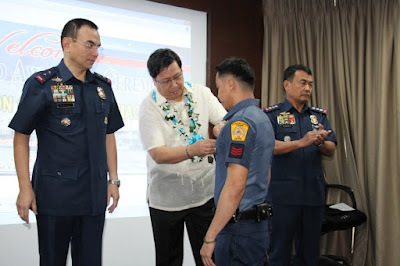 Kudos to NCRPO Chief for continuously cleaning up the ranks and commending the good cops and awarding them for their good service. These are the kinds of news that we have to make people know about. Too much of bad news is sickening and it demotivates people to do good. If we focus more on the good maybe more will get inspire to be better.